Introducing our Youngest contributor, all of 10 years, Arushi Dubey. 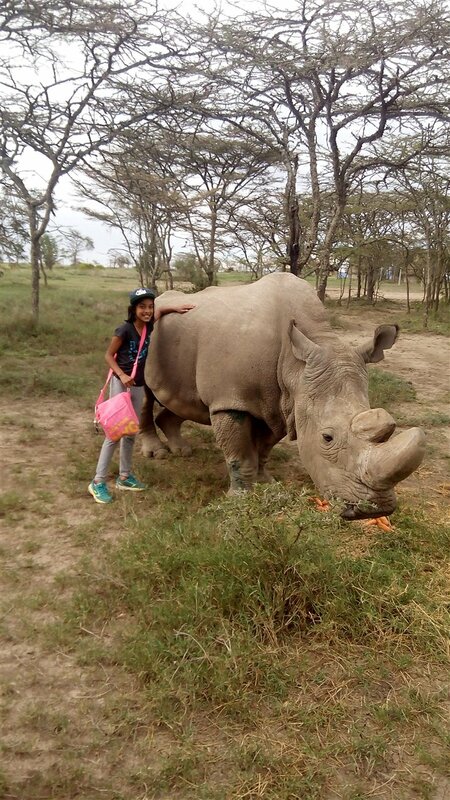 Here she has shared her remarkable experience at OI Pejeta Wildlife Conservancy in Kenya while on a two night School trip, sharing some amazing facts and things to do when here. Oh and its not only about our friends in the wild but some fun adventure activities too. Guess we have a completely different view of travel as the lil one, as we call her makes a splash on Bohotraveller! Are you ready for a breathtaking adventure at this exceptional wildlife conservancy , then what are you waiting for , join me as I tell you all about my school trip to this special place. The much-awaited day had finally arrived. It was a long 6 hours ride to the destination and back also held a big part of my adventure. Leaving at 9:00 a.m sharp in the morning from school and arriving just after lunch wasn’t easy, sore feet and tiredness was all we couldthink of after we got off the bus. But that was only until we heard about the activities we were going to do that day , rock climbing and BMX biking! Now that is what a fun trip is. Forgetting all about the tiresome journey and its effects on us, we were more than ready to seize the day! Before we started our activities we were split into to two groupsto ensure that so there was no rush for activities. After everything was completely sorted the group that was doing biking headed to the biking zone and the group which was going to rock climb walked to the rock climbing area. I was in the rock climbing group and could not wait to get on with it. We were fastened by rock climbing instructor with safety harness and helmet. A few minutes later,everything was set and it was time to climb! There were two rock climbing walls, the one on the right was an easy one to climb and the one on the left was a bit harder, but even so I was able to climb both. Rock climbing session was a success and i loved doing it! After my friends and I had finished 1 hour of rock climbing it was time to swap activities with the other group . It was time for BMX biking. But before we started to ride our bikes we learned a bit about them, like the parts of a bike and how they work. Then bike instructor showed us how to do a couple of tricks with the bikes he gave us , such as a front and back wheelie, most of my friends could manage to do them but unfortunately I failed at them. But right after the trick time that it was time to do some real biking! And actually to be honest bike trail was quite harsh as there were thousands of bushes and it was way too bumpy. I couldn’t stop falling of my bike as I’m not really that much of a good biker. Although the biking hour was very fun I had quite a number of bruises after I had done it. How many kinds of chimps you know of? That’s right we saw chimpanzees! Small ones, big ones, smart ones, lazy ones and lots more, it was like a chimpanzee madhouse! Although there were numerous chimpanzees in the sanctuary my favourite one would have to be Angela, she is seven years old and seemed to be the smartest out of all the others. We even got the opportunity to meet Rhinos face to face with. We all fed a black Rhino and also spent some time with Sudan- the last male northern white rhino. It was an amazing visit. Get ready to get your hands dirty because we’re planting trees ! Dig a place for your tree, place the young tree in the hole, moisten the mud by pouring in a bit of water, add some more mud to make the tree stay put and finally add some more water. It seems like a lot of work and it definitely is! And since we grew 2 trees named 5JK and Sugar flash it meant double the work and double the dirtiness! Butthe hard work is all worth it as the young Acacia saplings would soon grow into beautiful but pointy trees. Riding bikes near the wildlife of the conservancy wasonce in a lifetime experience for me. I loved to ride bikes while looking at animals and trust me it’s just as much fun as it sounds! We saw zebras, buffaloes, elephants and many such animals. But there are many lucky people who spot the big cat and the king of the Jungle- Lions! Well i was not amongst those lucky few, nevertheless the experience was something i would cherish lifelong. During the bush craft activities we all learned how to throw a spear, use a bow and arrow and make a warm fire. Obviously after the training we have all become strong survivors. This was a messy but fun job! We were all divided into groups of three to dig the cow dung and here is how my group managed to do this job: we started with one of us taking a wheel barrow and the other two carrying a shovel and rake all the way up the hill to where the dung was. Each group had their own heap of dung to dig. This meant me and my group had to collect a medium sized pile of dung all by ourselves! But once we had finished the job, taken the dung we had collected in a wheel barrow back down the hill and mixed all our dung with all the dung all the other groups had collected, I realized that this activity was actually quite fun. But luckily all the cow dung was dry so we did not end up looking like cow dung ourselves! On both nights after we had finished doing our night activities we would sip hot chocolate and get mesmerized by the hundreds and thousands of twinkling stars in the sky. In fact I have never actually even seen that many stars before! It looked just like a real life Starry Night. Ol pejeta is one of the most eco-friendly places you will ever go to. The showers are made with a pulley , a thick green fabric bag and rope. You first start of by putting the needed water inside the bag then lower the rope and tie it around something to make sure it’s secure. Once securedthat bag should have gone up and out of reach, then the pipe connected to the shower takes the water to the shower pipe, and voila there’s your sustainable shower! My experience at the Ol pejeta wildlife conservancy has been sensational, all the activities and fun things to do there were very entertaining, I had a fantastic time and have taken lots of beautiful memories with me back home. I would definitely recommend this place to every traveler or tourist visiting Kenya. I am Arushi, 10 years old and in grade 6 at Hillcrest Prep international school in Nairobi, Kenya. My favourite subjects are maths and science. My hobbies include playing guitar, arts and crafts,swimming, gymnastics, reading books and creative writing. I love to travel and when ever I get a chance, I travel with my parents to different destinations. Newer PostYou Would NEVER Guess- A Windy City Where East Meets West! Older PostKrabi- Nature's Abode And A Traveller's Dream!